When reproducing a firearm from the Lehigh Valley region, the question that often comes up is why these arms appear to have such a red finish. First, the red color comes from the finish applied over the wood, it is NOT a stain within the wood. Every original arm with a red finish that I have handled shows the color was somehow applied as a varnish. In areas of wear and on sharp corners where the finish is thinner or gone entirely, the wood underneath shows a light amber color (mixed with years of dirt and grease rubbed in as well). 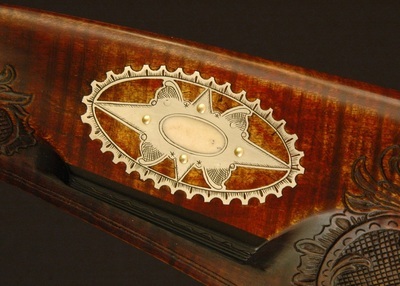 The color of the bare wood usually appears as though it was lightly stained with aquafortis, or was merely sealed prior to surface layer application. 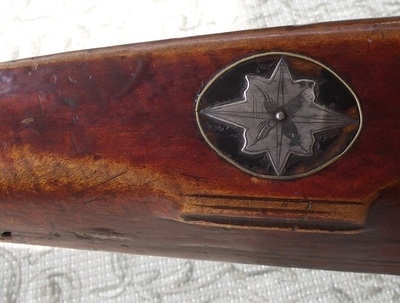 Other gunsmiths and historians have documented the use of two primary types of red varnishes on these arms: Dragon's Blood resin, and Madder pigment. 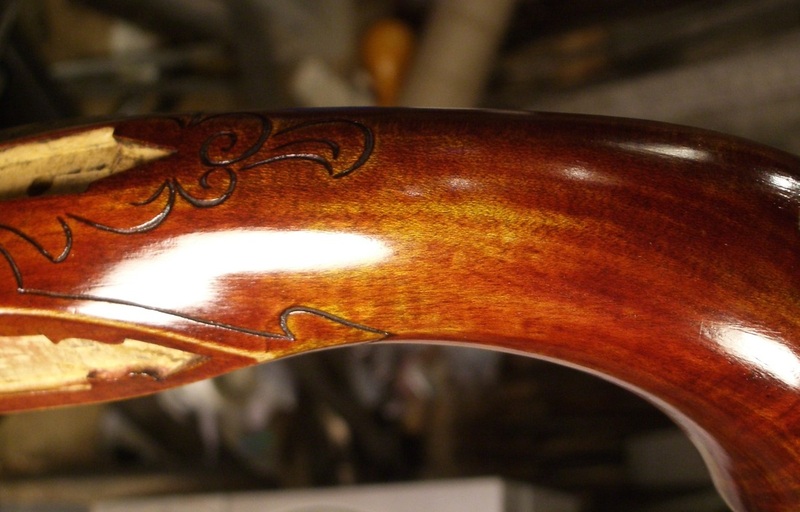 Both of these colorants have roots among luthiers, who would use colored finishes so as not to stain the fragile tone-wood of their instruments. In my experiments on arms and with test pieces of wood, I like the color that a mild wash of aquafortis provides for an amber base color in the wood. Red varnish over a bright white piece of maple tends towards a more magenta or pink color. Since both of these finish processes build on the surface of the wood, it is important that the wood be sealed well with either a thinned varnish or lac product. If the pores remain open, then the red finish fills them and creates red speckles underneath the finish. Some artists have used aniline dyes mixed in with polyurethane finishes to replicate the look of original style finishes. 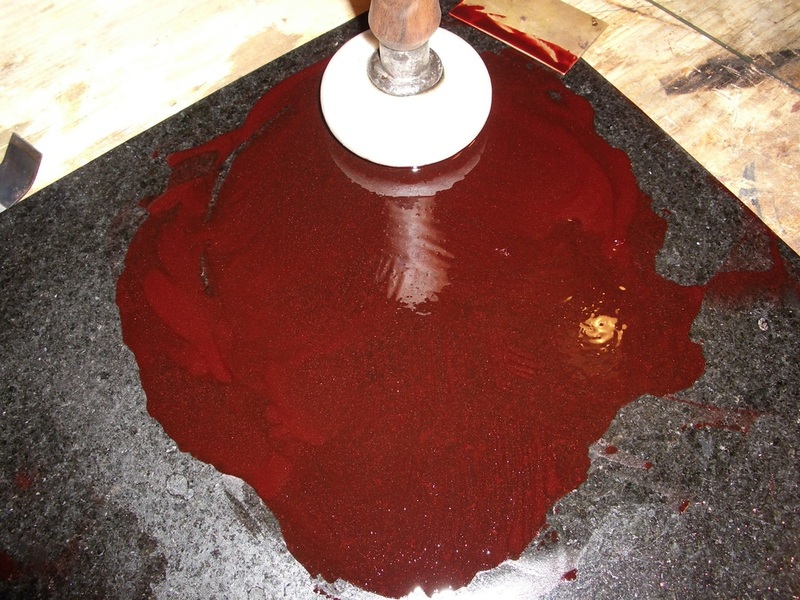 This is suitable for replicating thinner dragon's blood finishes, but I've found nothing that compares for the red depth of madder pigment. 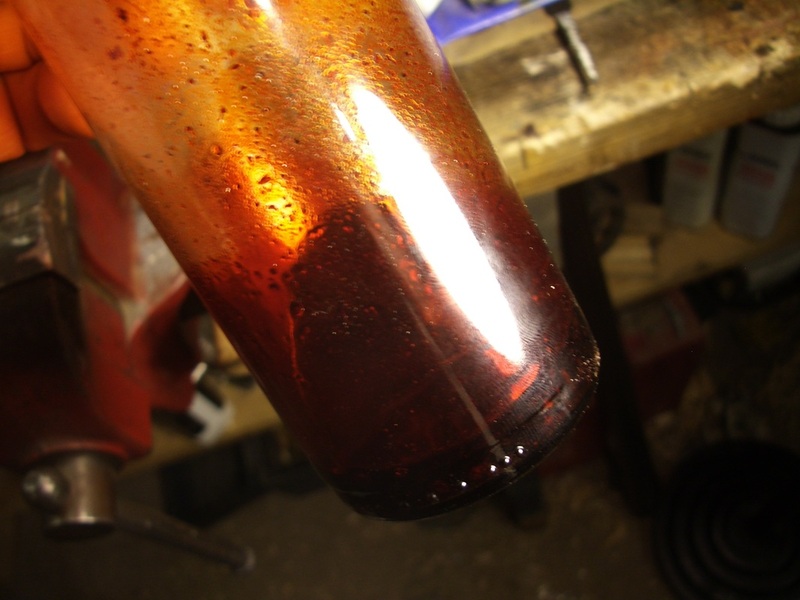 Another potential downside to using aniline dyes is that red is notoriously prone to fading with exposure to UV light. Both Dragon's Blood resin and Madder pigment are much more lightfast in a varnish finish. Dragon's Blood is a type of palm tree resin obtained from several different species. I order mine as a finely ground pigment from Kremer pigments, #37000 "Resina Draceana, from Sumatra". It is dissolved in denatured alcohol and becomes a spirit varnish, just like shellac. It dries as the alcohol evaporates, and is therefore a very quick finish. It is applied in the same manner as a French polish, built up in many layers, depositing what is essentially pure dragon's blood in a very thin layer over the entire stock. It has the advantage of being quick to apply and is a beautiful rich glossy finish. The disadvantages are the same as any alcohol based finish, it can be somewhat brittle and may not hold up to wet weather (or hands) as well as a cured oil varnish will. According to original violin varnish recipes, the addition of lavender spike oil (a few drops) helps make the finish less brittle. Madder lake pigment is derived from a type of plant root via a chemical process. I order mine as "Genuine Madder Lake" from Kremer pigments. It's pricy stuff, but a 50g jar is enough to finish several rifles with. It is my opinion that many of the really deep red Kuntz pistols are finished with a madder pigment red violin varnish, applied over a lightly stained (if stained at all) stock. The pigment must be mulled into your varnish of choice. Glass mullers can be bought at art specialty stores - I made mine from a marble doorknob with the base ground perfectly flat. The key point with mulling is to create a super fine suspension of the pigment particles within the varnish. The pigment will not dissolve in the varnish, the better job you do when mulling the pigment, the finer the finish will be. You are essentially creating a translucent paint for your stock, and it should be the consistency of slightly thinned oil paint. This paint is rubbed onto the stock in very thin layers and allowed to dry. I've found that after a couple coats, the finish becomes slightly grainy, and needs to be rubbed slightly with burlap or steel wool to smooth it out. Translucent red iron oxide pigment can also be used, but I have found it doesn't have the translucency that madder pigment can provide. It should be somewhat thick; spar varnish, tru oil, or other un-thinned linseed or tung oil based finishes. It needs to dry slow enough that you can rub it out in thin layers. Be mindful of your carving - this is a thick building finish and can quickly fill and obscure the details in fine carving.